Moru Kachiyathu also called Kachiya Moru means seasoned and spiced Buttermilk. Moru is Malayalam term for buttermilk. 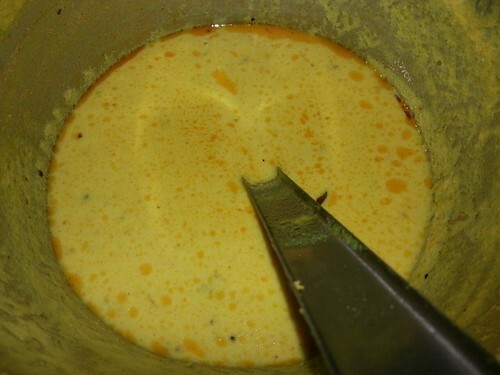 Also called Moru Curry this seasoned and spiced buttermilk is one of the simpliest curry prepared very frequently in most of the houses in Kerala. A curry made with curd is soothing and it is one of the main curries in Kerala cuisine. To make Moru Kachiyathu, buttermilk is mix with water in a cooking pot and then add curry leaves and salt. When steam comes up the the pot, it must be removed from the flame. Then spices, such as mustard seeds, fenugeek, chopped onion along with chopped ginger, garlic and whole red chili, chili , turmeric and cumin powders are fried in oil. This fried spiced mixture is then added to the Moru. Moru Kachiyathu which is also spelled Moru Kaachiyathu goes well with rice. Below is a picture of Moru Kachiyathu, Moru Kaachiyathu or Kachiya Moru which was one of the main curries served during a wedding in Allepey, Kerala, India.